Tablets can be slippery little gadgets. That’s why its important to protect your investment with a case or enclosure that will prevent the device from not just hitting the floor or but also hitting the road. Hand held cases usually feature a strap that makes it possible to hold your tablet safely with one hand. Rubber or hard plastic edges prevent tablet breakage if dropped but not all include a way to secure the tablet if left unattended. Griffin’s Airstrap offers portability and padded protection but lacks any way to secure the tablet. Gladius’ Air has a leather strap along with a prop up for viewing on a tabletop but again nothing to keep it from walking out the door. Some handheld cases include a lock to secure it, like the Lilitab Tether which permits you to secure your tablet but still allow for guests to pick it up. It includes a built-in cable egress slot so you can keep your tablet powered 24/7. Maclock’s iPad Security Case and Lock Bundle has a detachable 6 foot cable lock. This allows it to be placed on a table and picked up when necessary but not carried away. Desktop enclosures protect and display your tablet if you want to place it on a counter or table top. Most are lockable and feature a heavy base for support. iPad Enclosure’s Gravity Flip lets you “flip” or pivot the screen up-and-over almost 180 degrees. Lilitab’s Counter Pro includes a docking feature that connects and charges the tablet while displayed inside the enclosure. Other models for different surfaces and wall mount are also available. Free-Standing, or Floor Mounted, enclosures or stand alone kiosks allow you to place and lock your tablet just about anywhere and leave it unattended (such as a mall or retail shop). Lilitab’s Standard is lightweight and can be attached to a base, placed on wheels, or drilled into floor. iPad-Kiosk’s heavier weight options like the Dynamic feature an impressive metal tower and are easily branded with a graphics panel or other signage. 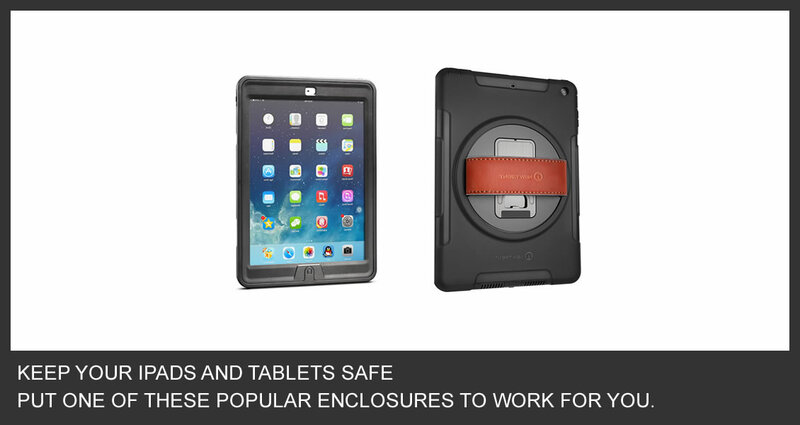 The bottom line is, if you plan to use your tablet in a public place, it needs to be protected with some kind of case or enclosure. If you find a particular tablet enclosure that you recommend please let us know the make and model and we’ll be happy to share it with other iCapture clients.